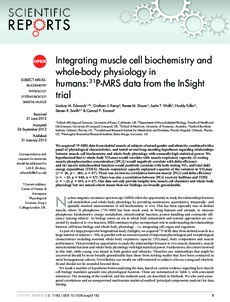 We acquired 31P-MRS data from skeletal muscle of subjects of mixed gender and ethnicity, combined with a panel of physiological characteristics, and tested several long-standing hypotheses regarding relationships between muscle cell biochemistry and whole-body physiology with unusually high statistical power. We hypothesized that i) whole-body VO2max would correlate with muscle respiratory capacity, ii) resting muscle phosphocreatine concentration ([PCr]) would negatively correlate with delta efficiency and iii) muscle mitochondrial function would positively correlate with both resting VO2 and total daily energy expenditure (TDEE). Muscle respiratory capacity explained a quarter of the variation in VO2max (r2 = 26, p < .001, n = 87). There was an inverse correlation between muscle [PCr] and delta efficiency (r = −23, p = 046, n = 87). There was also a correlation between [PCr] recovery halftime and TDEE (r = −23, p = 035, n = 87). Our data not only provide insights into muscle cell chemistry and whole-body physiology but our mixed cohort means that our findings are broadly generalizable.